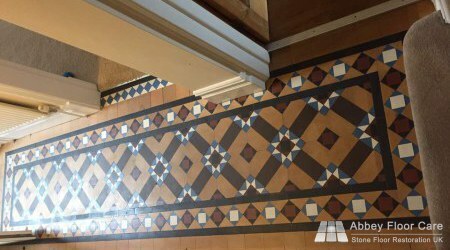 This Minton Tile Cleaning Stafford Project arose as our client searched for a Minton Tile Cleaning Stafford. 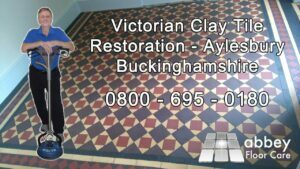 They found our Minton Tile Restoration service website and contacted us for help with their floor. 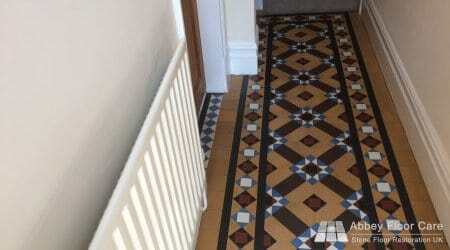 The floor had ingrained soil and some areas of chipped tiles. I explained that I could clean and seal the floor and fill the chips with coloured resins. I also recommended that finish waxing the floor would make it easier to clean and stay cleaner for longer. The cost including waxing was over my client’s budget, so we agreed that I should supply the wax. I would also show my client how to apply the wax to achieve a low-sheen finish. 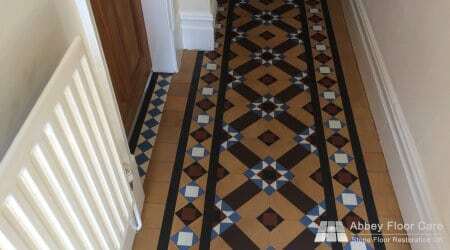 This brought the Minton Tile restoration service within budget. 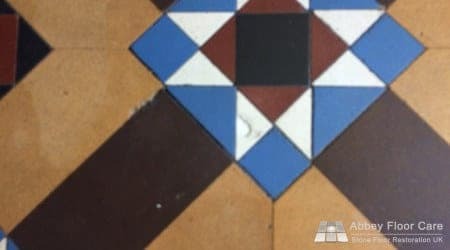 I applied our Minton Tile Cleaner and left it to work on the surface soil for around 20 minutes. I then used a rotary scrubbing machine and scrubbed the cleaner into the surface of the floor to lift the surface soils from the stone. I then rinsed the floor a number times with clean water to remove all the cleaning residue. Once the floor dried, I carefully filled the chipped tiles with a hard filler. 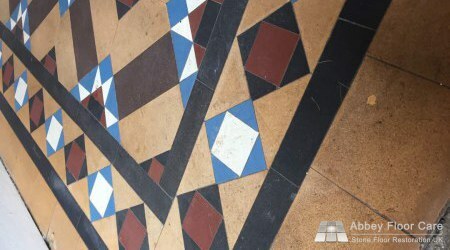 The fillers were applied using a process that left the repairs smooth with the surface of the tiles. The system prevented the need for sanding the filler smooth with the floor. I sealed the floor with three coats of colour enhancing impregnating sealer. 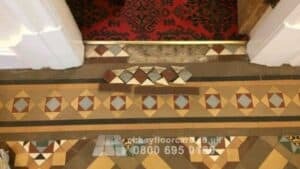 The impregnating sealer helps protect the floor against water and oil spills and makes the tiles much easier to clean. Finally, I demonstrated to my client how to apply the wax finish. 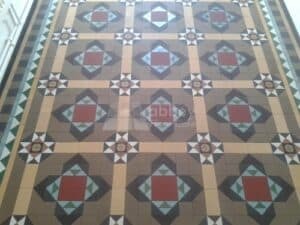 My client was thrilled with the results of the Minton Tile cleaning and sealing work we had completed. 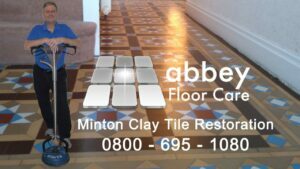 If your Minton tile floor is grubby, contact Abbey Floor Care for your free, no-obligation Minton floor restoration quotation.